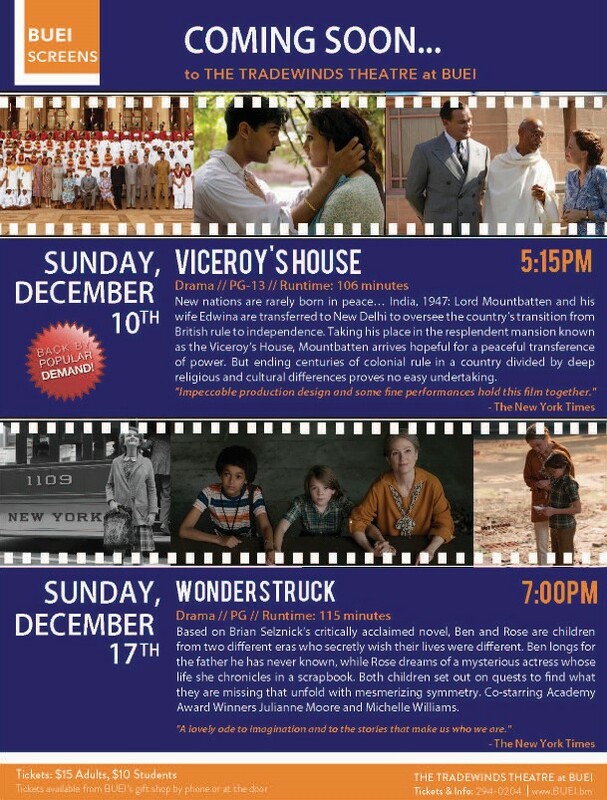 The Bermuda Underwater Exploration Institute [BUEI] is getting set to screen two films, Viceroy’s House on Sunday, December 10 at 5.15pm and Wonderstruck on Sunday, December 17 at 7.00pm in the Tradewinds Theatre at BUEI. The event poster says, “New nations are rarely born in peace… India, 1947: Lord Mountbatten and his wife Edwina are transferred to New Delhi to oversee the country’s transition from British rule to independence. “Taking his place in the resplendent mansion known as the Viceroy’s House, Mountbatten arrives hopeful for a peaceful transference of power. But ending centuries of colonial rule in a country divided by deep religious and cultural differences proves no easy undertaking. Tickets cost $15 for adults and $10 for students, and are available by calling 294-0204 or visiting BUEI’s Oceans Gift Shop.